Have you ever been driving on a dark road and the driver behind you has forgotten to dim their lights or for some reason they decided to drive quite close to your rear-end causing them to nearly blind you with their headlights. This has probably happened to every driver and it can make driving painful, dangerous, and raise the chances of an accident. 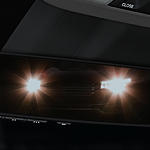 But, due to a new electrochromatic rearview mirror technology, your rearview mirror can automatically detect the bright lights and then temporarily darken the mirror in order to save your eye strain and lessen the brightness of the reflected image. This special new rearview mirror technology is found on many models available in Westbury. Our sales team at Auto Gallery Imports would be more than happy to help you select an automobile that features this helpful auto-dimming rear view mirror. Generally, we carry several models having this standard accessory. Our highly skilled sales personnel can showcase how this feature can help those with sensitive eyesight drive safe on the roads. Come in today and let us demonstrate the auto-dimming rear view mirrors on one of many affordable automobiles.